Check out the latest scores, order of play and watch live video from up to five courts. Over on Court One, Heather Watson and Finland's Henri Kontinen are set and a break up in the semi-final of the mixed doubles. You can watch over here. But that is our lot for our text coverage today. Thanks for joining us. See you tomorrow. This is the moment that a piece of history was written, when the greatest of this era confirmed her status as the best of the Open era as whole. After six other Wimbledon victories, it is danger of feeling routine. Really though it was a cast-iron 'I was there' print-the-tshirt day. Not many people are known just by their first name. The Donald and Serena are two who pass that test. Britain's Heather Watson and partner Henri Kontinen of Finland are playing in the mixed doubles semi-finals on Court One. The pair took the first-set tie-break against Oliver Marach and Jelena Ostapenko 7-6 (7-1). Roberta Vinci - who beat Serena Williams in the semi-finals of the US Open last year to end her bid for the calendar Grand Slam - sends her congratulations. If Serena can keep her motivation and stay healthy I think she can be the greatest ever. I think she is and will be, but she needs to do it. The final was excellent. The difference was the serve. That was the difference because their groundstrokes they matched up so well. It is the most beautiful serve ever. I remember seeing Serena when she was probably 12 or 11 and her technique was beautiful and she is such a terrific athlete. Serena hates losing and I think that is what makes her so great. Serena Williams also owns 13 women's Grand Slam doubles titles with older sister Venus - can she make it 14 when she plays in the final later today? They take on fifth seeds Timea Babos and Yaroslava Shvedova after the men's doubles final, which is just knocking up on court. Despite her defeat, Angelique Kerber moves back up to second in the world rankings. This is the 20th time the number two spot has changed hands since Serena Williams moved top of the rankings in February 2013. I don't know if someone else can have longevity that Serena has had, it is 17 years since her first title. Mega famous American talkshow host Ellen Degeneres. Kerber blinked twice and Serena was playing at an amazingly high level to take advantage. Kerber did everything she could to stay with her. It was a great, great straight-set match. Serena Williams pauses to sign programmes on her way off court before carting the spoils off behind the scenes to have her photo taken alongside an honours board riddled with the name 'Williams' one way or another over the last couple of decades. Chairman of the All England club Philip Brook shoots the breeze for a bit before leading Serena up to a reception from the Royal Box dignitaries including Bille Jean King, Chris Evert and chat show host Ellen Degeneres. Then it is out on the pavilion balcony to show the trophy off to the crowds below. 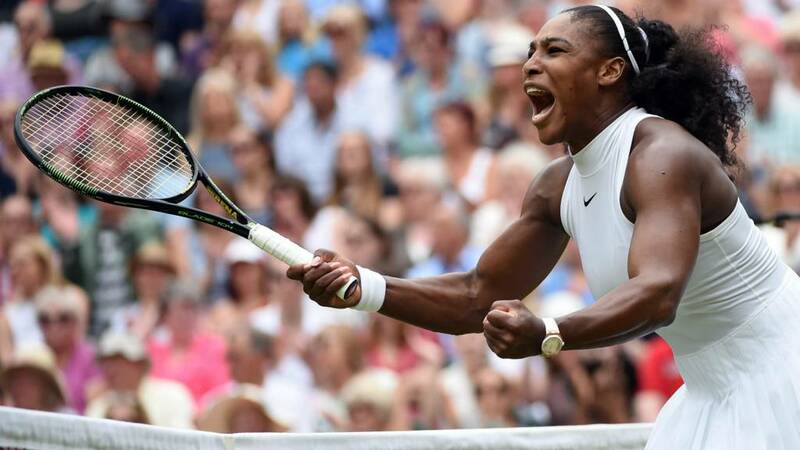 This has been the goal since Serena left the tournament 12 months ago, to get to 22 and seven Wimbledon titles. She has been a woman on a mission for two weeks. She had one iffy match against McHale and that was it. Serena to beat Court's record? I do think it is highly likely that will happen, she has tremendous will and desire. If you want to be the greatest of the great, that is the way you have to play. I don't see anyone on the horizon that will mean she doesn't get at least a couple more quickly. Margaret Court leads the way with 24 Grand Slam titles. More from Serena Williams, on matching Steffi Graf's Grand Slam record: "It's been incredibly difficult not to think about it. It makes the victory even sweeter to know how hard I worked hard for it. "This court definitely feels like home, I have a match later today in the doubles, so I'll be back out. I don't know what else to say, I'm so excited."